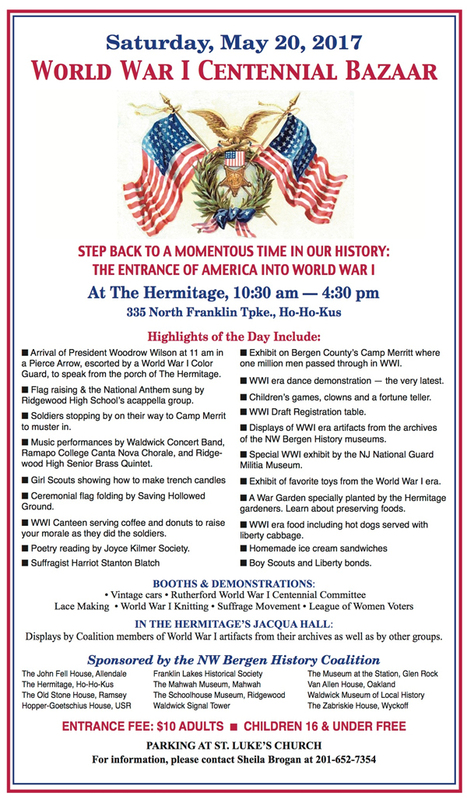 The Northwest Bergen County History Coalition is presenting its WWI Centennial Bazaar at the Hermitage in Ho-ho-kus Saturday, May 20th 10:30 AM – 4:30 PM on Franklin Tpk. Parking is available at a nearby Realtor office and on nearby roads. Greet Pres. Woodrow Wilson at 11AM as he arrives in his vintage car. Commemorative activities will be taking place throughout the day. 11 local history groups will be offering their representations of world shaking events of 100 years ago. Check out all the activities on the flyer and remember the veterans of WWI. Visit www.oaklandhistoricalsociety.org for more details.